Facebook has recently launched its latest feature that allows you to find venues that provide public and free Wi-Fi. Introducing ‘Find Wi-Fi‘. 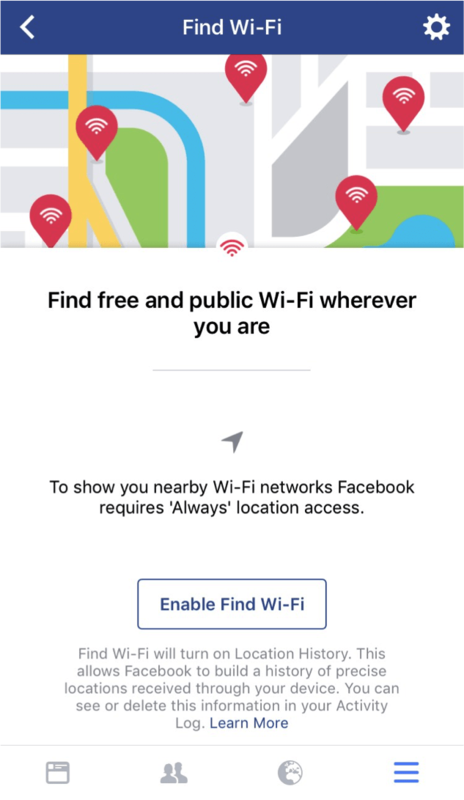 If a business has shared that they provide Wi-Fi on their Facebook Page, the business will be added to the Find Wi-Fi map, where users can find out more about the business and navigate to the venue. Who Can Use ‘Find Wi-Fi’? The feature was tested in some countries in 2016, but as of 30 June 2017, Find Wi-Fi is now available globally. The feature is available to all iPhone and Android users. How Do You Find Wi-Fi Hotspots? On the Facebook app, click the ‘More’ icon and scroll down to ‘Find Wi-Fi’. If the option isn’t there, select ‘See More…’ and the option should appear. Once in the ‘Find Wi-Fi’ tab, enable the service and you will now be able to explore available hotspots on a map and learn more about businesses hosting them. Who Benefits from the Feature? Particularly in South Africa where costly mobile data is a constant struggle, being able to find free Wi-Fi would significantly help people who have limited access to the internet. Students and entrepreneurs and students, in particular, could really benefit from this feature. Businesses can enhance the chance of discoverability by firstly providing (preferably free) Wi-Fi, and making sure to add this detail to their Facebook Page. This can be a persuasive offering when considering a business meeting spot or study group location. Facebook is an absolute innovation machine that is constantly releasing features to improve the user experience. With features like this, it’s no wonder Facebook is the largest social media platform with 2 billion monthly active users.